If you haven’t read the first part of my Malaysia trip , I encourage you to read that first. After visiting 3D museum, we entered the skyrex where we sat on a tram styled simulator and taken a 5 minute fun filled journey which includes a 3D film projected to the front and both sides of the tram, water spay, vibration etc made it more interactive and multi-dimensional. Skydome provides 360 degree panoramic view of Langkawi with approximately 7 minutes show. The highlight of this trip was the skybridge and 3D Interactive museum. On the way back to the hotel the driver offers to take us to Pantai Cenang beach with some extra ringgits per hour. 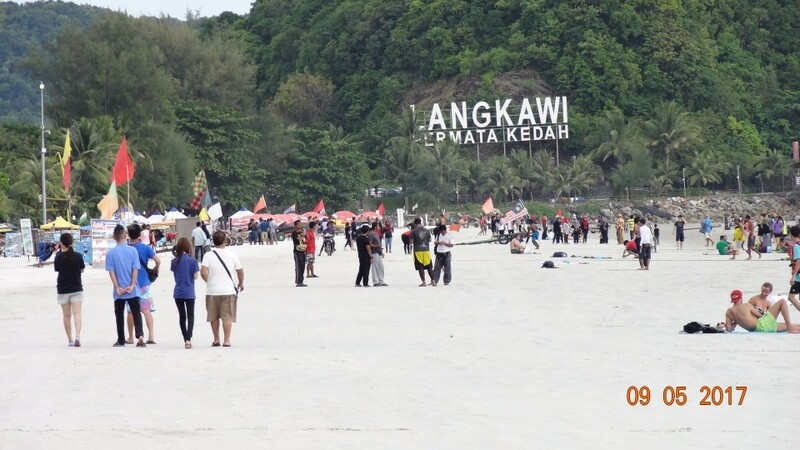 It is one of the famous and busiest beach in Langkawi with white sand and clear water. The beach is lively with exciting water sports such as jet skiing , parasailing, banana boat rides and also plenty of beach front bars , cafes, restaurants. There were many duty free outlets and sovereign shops. We spend some time in the beach then had a walk on the picturesque beach strip. Many Indian restaurants like Bombay palace, Royal India were there. We had our dinner from one of the restaurants. 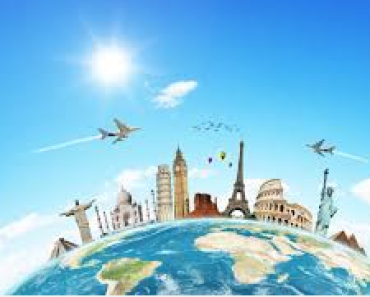 High-end resorts as well as budget hotels with view of Andaman sea are a plenty there. Next time if we are going to visit Langkawi surely book a hotel in Pantai cenang beach. 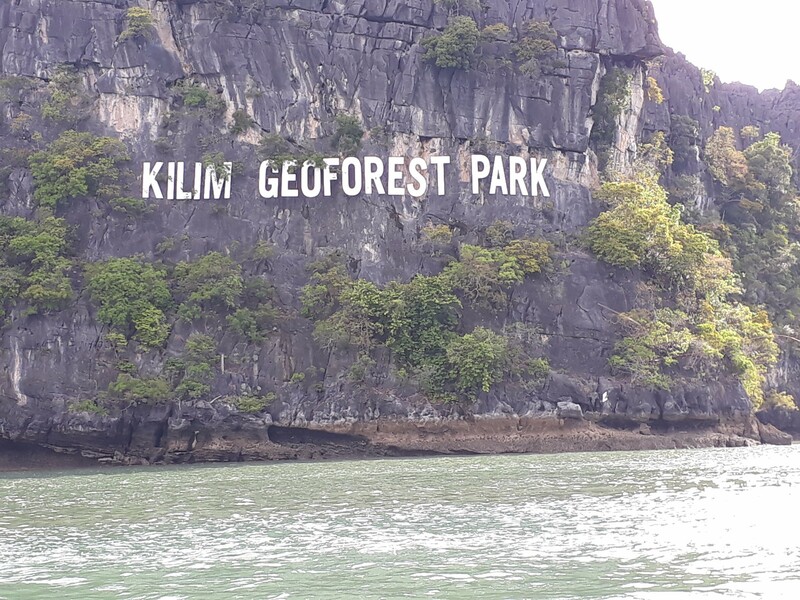 On May 10th 9:00am after the breakfast we waited on hotel lobby for our Langkawi half day city tour., which includes Eagle square, underwater world Langkawi, and Alma Alam Batik art village. Our first stop was at Batik art village. First a lady showed us a short demonstration of batik painting. They had a variety of accessories made from hand drawn batik together with lots of smaller items such as batik wallets, bags shoes etc. But it was really expensive. Our next stop was at Langkawi under water world, it was located very near to Pantai cenang beach. It has more than 200 different species of marine and fresh water fish. In front of the entrance door itself we could see Araipamas – the world’s largest fresh water fish in a medium sized tank. Langkawi’s under water world was small when compared to Singapore’s underwater world. Still we enjoyed and had a nice time looking at all penguin, sharks and many other fishes. Near to the under water world cocovalley duty-free shop was there which was really big. We spend almost 15 minutes there and had a glance at some of the cute items there. 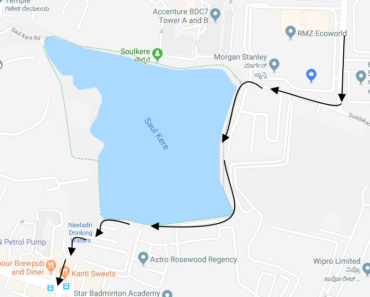 There is a small lane adjacent to under water world which connects to the beach. We had few more snaps of white sand chenag beach. Our last stop was at eagle square Dataran Lang is one of the Langkawi’s best man made attractions. 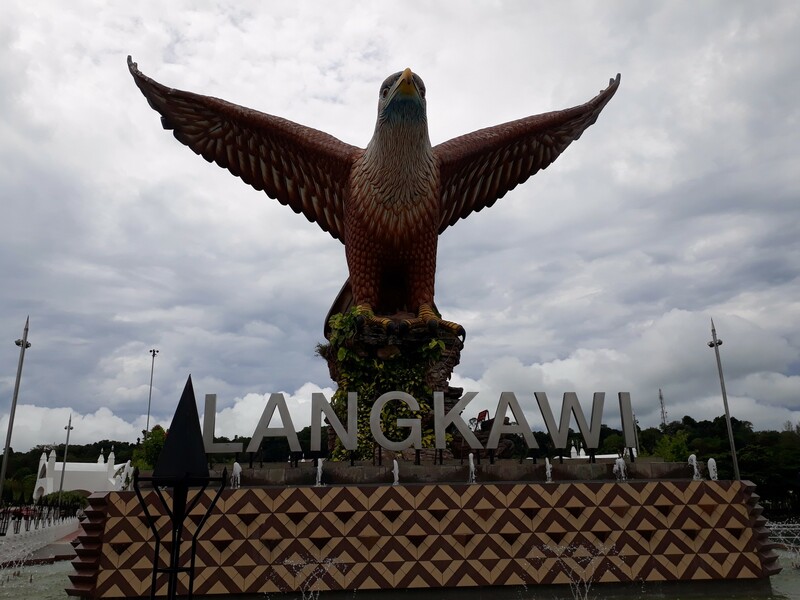 The reddish brown eagle is a symbol of Langkawi. The name of this island is derived from two malay words – Helang means Eagle and Kawi means reddish brown. Also from here we could watch ferries and yatches ply across the harbor. It was an ideal place for some good snaps wih awesome view of bay that opens out to the sea and also with the backdrop of mountains. On the way back to hotel they made a stop near one of the shopping malls and we had our lunch from MacDonald there. The highlight of today’s trip was definitely 12 meter sculpture of reddish brown eagle which is poised to take off. It was drizzling in the evening, we went for a walk with the umbrella. There were plenty of duty free shops which sells chocolates, liquor, wine & bear, cigarettes/cigars, perfumes, cooking ware & cutlery items , bags etc. Kuah town is a hub of these duty free shops which are really cheap. We had our dinner from Spice road – north Indian and Yamen restaurant. Today May 11th,2017 our trip was to Mangrove forest at 3:00 pm in the evening. It was a cloudy day. 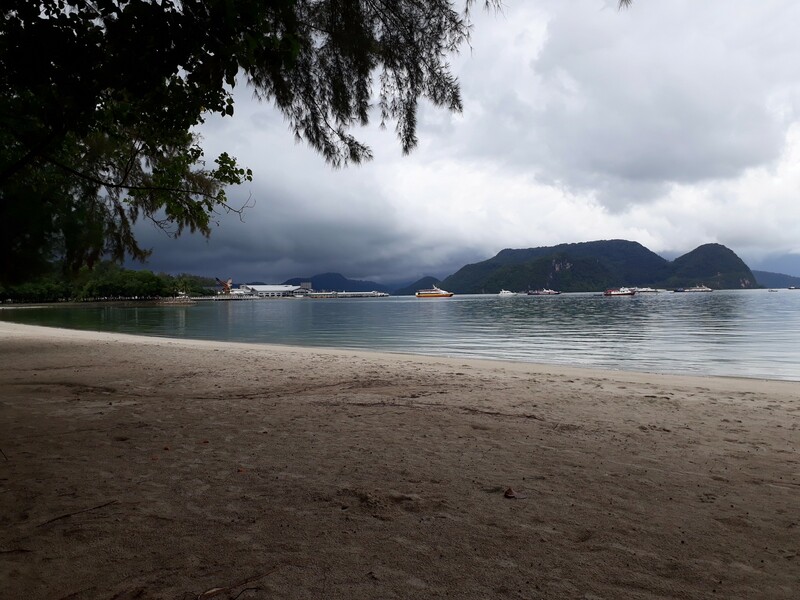 After the breakfast we thought of going to cenang beach or some other beach, then dropped the plan due to continues rain. By 11am the sky was little bit clear. We decided to explore the other side of our hotel. After 10-15 minutes of walk we reached chogm park. 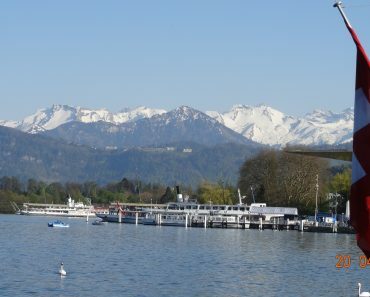 The park is marked by a large white concrete structure with mountain as the backdrop. 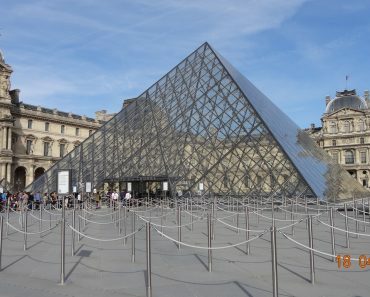 It was build to commemorate the 1989 common wealth heads of govt meeting. Flags of all participating common wealth countries fluttering on the top of this structure. There is a man made beach next to chogm park. But it is not suitable for swimming. We took some beautiful snaps of white sandy beach along with shady trees of park. After spending one hour we returned to our room, and had a nice refreshing bath in the swimming pool. By 3 o clock we were ready in the front of the hotel. The driver took us to the kilim jetty point where the mangrove tour begins. It took nearly 15 minutes to reach there from our hotel. On the way he picked two other families from different hotels. we were almost 20 people in a boat. The guide started explaining about the mangrove forest. Though all the trees look alike , there were nearly 2000 varietes in that forest. First stop was at Bat cave. Bat cave was smelly but the guide explained nicely and it was interesting. We could see thousands of bats inside the cave. The next stop was at crocodile cave. No crocodiles was there , this name is due to the shape of the entrance of that cave. A newly married couple was there in our group. They thoroughly enjoyed by taking snaps . In between the driver increased the speed and it was a thrilling experience. Next step was at floating fish farm. A guy showed different types of fish. Eagle watching & feeding was also interesting. Finally we took a U turn at thailand border, it was a different experience with gigantic limestone on one side and dense green mangrove forest on other side. The next day we check out from our hotel by 7 am and took our 9am flight to KL. 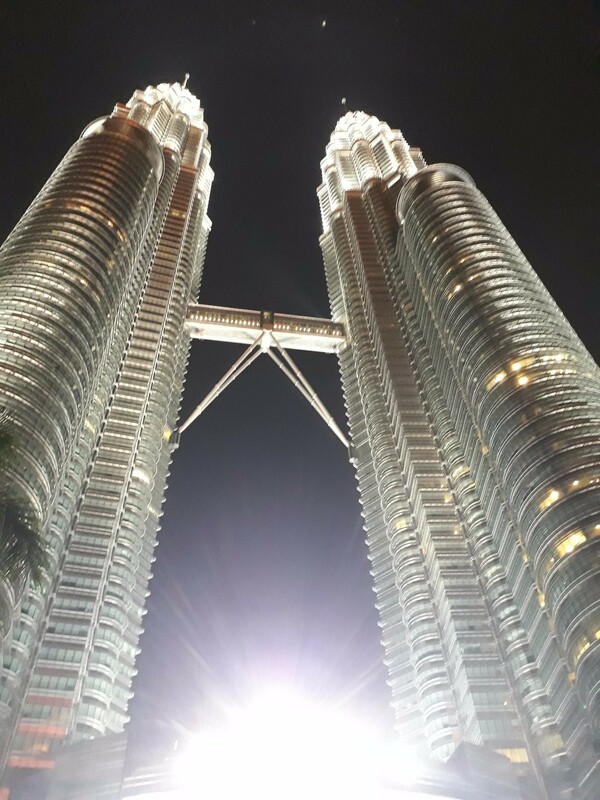 from KL airport we were taken to the Corus hotel, Jalan Ampang, which is located 5 minutes walk to iconic Petronas twin tower. By 12:00 noon we reached the hotel. Everyday at 10:00am and 4:00pm there are free shuttle bus to petaling street and Bukit Bintang from Corus hotel. We decided to use that facility and went to petaling street. Petaling street is a china town located in KL. You can bargain here and buy souvenirs, t-shirts, watches , belt, etc. Food is plenty here with different varieties especially Chinese food. You should come here with empty stomach and try the special juices and dishes. Adjacent to Petaling street there is central market which is one of KL’s most familiar landmark and a popular tourist attraction. It is also called as Pasar seni. In the main building there is a broad range of shops which offers wide verity of souvenirs, pictures, silverware, leather items and much more. 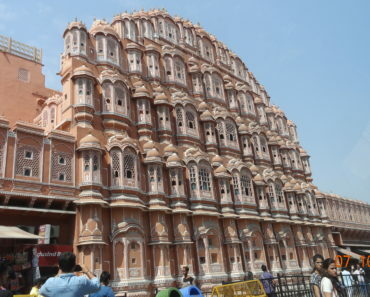 The full building is air-conditioned. In the second floor there was a food court. 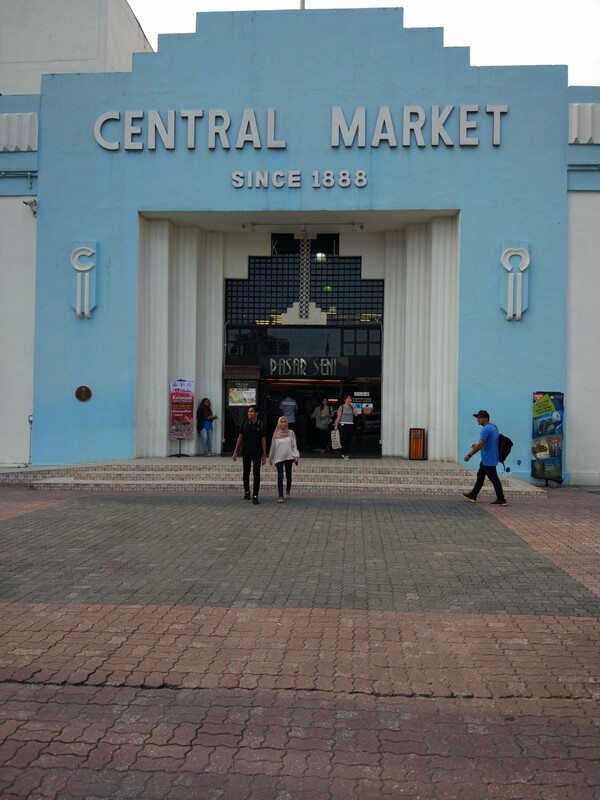 We spent almost 2 hours in central market. By the time we were really tired. 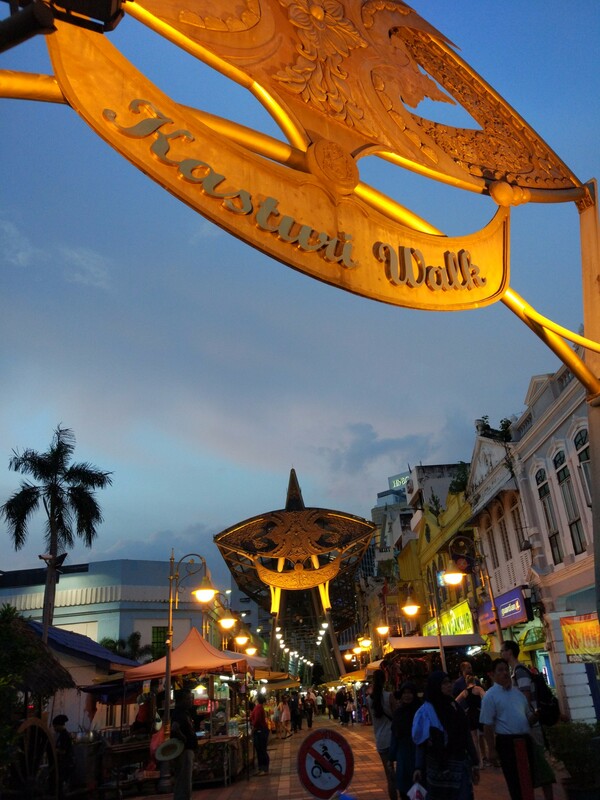 Near to central market, there is kasturi walk some what similar to chinatown. We had a quick glance of some of the shops and then moved towards the direction of metro station.On the way to the LRT station there is a Indian hotel where food is very cheap. Plain rice cooked in coconut milk (Nasi Lemak) will be given with different varieties of curry which you can choose. We took the train and got down at KLCC station and had one minute to Corus hotel.